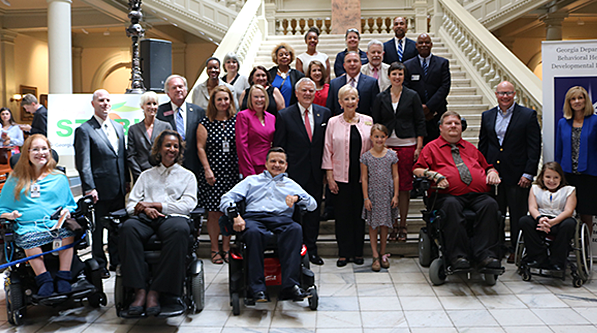 The mission of the Georgia Council on Developmental Disabilities (GCDD) is to bring about social and policy changes that promote opportunities for persons with developmental disabilities and their families to live, learn, work, play and worship in Georgia communities. GCDD envisions a state in which all persons are included in all facets of community life, have choices while exercising control over their lives and are encouraged to achieve their full potential. We value people with developmental disabilities with their own gifts and talents, and as independent contributors to a collaborative community. We value available, accessible, flexible, and responsive services, which enhance people’s participation in the community. We value educated and supported families who make significant contributions to caring for and assisting people with developmental disabilities in preparing for their futures. We value public policy founded on sound research, accurate information, and best practices in alignment with the principles of the Developmental Disabilities Act. We value public advocacy that is founded on the development of relationships with stakeholders and the legislative community. We value communities, which are designed to be inclusive, allowing for full participation by all people, physically, economically, organizationally, and environmentally. We value communities that educate, respect, promote, and protect the rights of people, thus offering a wealth of opportunities, and which have the capacity to find solutions.